Synastry is the practice of comparing how the planets and houses in two people’s charts relate to each other. The primary way astrologers do this is by looking at the aspects that planets make to each other, and by looking at where someone’s planets fall in relation to their partner’s houses (especially the angles). The following synastry articles can help you to decipher your own relationship. 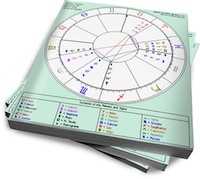 Purchase a personalized synastry report for a comprehensive explanation of the above factors in your partnership. Use the discount code “sassy718” at checkout for 10% off! Synastry Basics: Who Is Really “Right” For You?